It is natural and completely normal for dogs to shake. 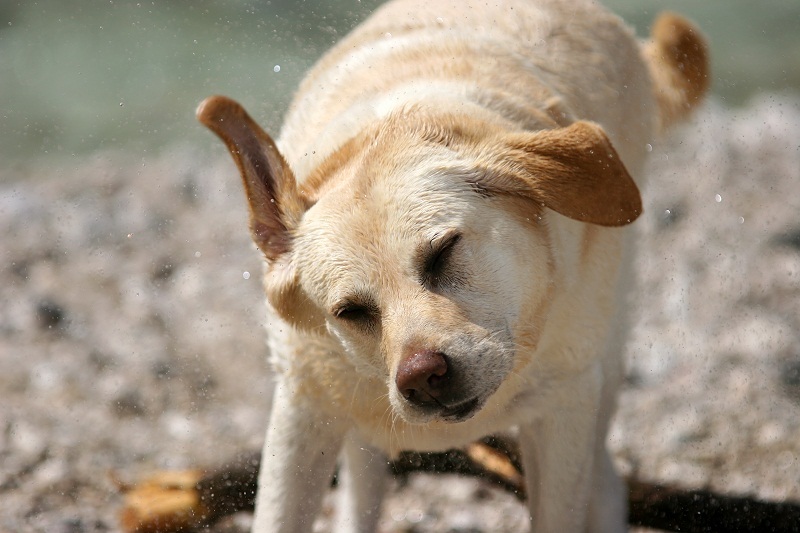 You will see your dog's shaking when they are drying off, playing or stretching out. The thing you need to understand is that not all shakes are normal. Sometimes, what you think as a shake can be a seizure. The basic difference is that a seizure will make your dog lose all body control and paddle their legs while convulsing while a shake doesn't exhibit these signs. So, do you want to know "Why does my dog shake?" Keep reading to learn more about it. Dogs often shake for many reasons. You don't have to worry about some while some need your attention. Read on to know more. Dogs usually shake when they are anticipating something or are very happy. If you've been away from your dog for quite some time and have returned, it is normal for your dog to feel excited about your arrival and tremble a bit. Similarly, your dog may feel excited about chasing a cat or at feeding time. In some cases, your dog will act smart and give you some pretend shakes to get your attention or to spend some extra special time with you. This is also one common answer to "Why does my dog shake?" Pooches are afraid of so many things, especially fireworks. Similarly, some dogs become anxious at traveling time. Some may even get carsick and shake a lot. Some dogs think a car ride means an appointment with the vet, which will make them anxious. What it means is that dogs express their feelings of being very upset by shaking. Holding them close to you will help calm their nerves. Isn't it obvious? Just like humans, dogs will shake when the temperature outside is on the lower side. A simple solution is to get your dog a warm doggie sweater. Also, remember to wrap your small dog in a towel after a bath to relax his shivering instinct. You may even have to blow dry your dog if he's especially sensitive to the drop in temperature. Dogs cannot tolerate all the substances that humans can. The list includes chocolates, cigarettes and xylitol. If they have it, you will have a very shaky dog in front of you. Some dogs eat cigarettes, which gives them nicotine poisoning and shakes. Many other substances can also be poisonous to your dog. For instance, Metaldehyde, a substance usually found in snail baits, is toxic to dogs and may bring on intense muscle tremors and convulsions. Go to see your vet if you suspect your beloved dog has eating something toxic. If you have an old dog, you shouldn't ask, "Why does my dog shake?" because it's quite common for dogs to tremble when they hit their senior years. Their front legs as well as hind legs can develop tremors, and it sometimes becomes difficult for them to stand or walk if they also have arthritis. You may still want to take your dog to the veterinarian to ensure there's nothing serious causing this shaking and trembling. In addition to the causes mentioned above, some dogs may shake and tremble because they have an underlying illness. Instead of asking, "Why does my dog shake?" you should contact your vet and rule out the possibility of your dog having a serious disorder or health condition. Here are some of the most common illnesses that can make your dog to tremble. Distemper: Caused by a virus, it usually affects puppies and adolescent dogs that may have not been vaccinated. Tremors are a common signs of distemper in dogs, and you will also notice some other signs such as coughing, fever and nasal discharge. You can only provide your dog with some supportive care until his immune system eliminates the virus. Your vet may also prescribe airway dilators, antibiotics and fluids for better results. Generalized tremor syndrome: It's usually known as steroid responsive tremor syndrome, which usually affects small, white dogs such as West Highland white terriers. However, it can affect other dogs of any breed and color between 9 months and 2 years of age. Your vet may prescribe corticosteroids such as prednisone for treatment. Nausea: Medication, motion sickness, eating the wrong stuff and eating too much can make your dog nauseous. A kidney or liver disease may also be the reason why your dog is feeling nauseous. When your dog feels nauseous, you will also notice shaking and trembling. Other signs of nausea are lip smacking, listlessness, salivating more than normal, yawning, hiding and vomiting. Fever: If your dog shakes with body temperature going down, it means he might have a fever. Your dog shakes in an effort to raise his body temperature which is lowered in response to a drug reaction, an infection or other triggers. Use a rectal thermometer to take his temperature, which should be between 103 and 106 degrees if your dog has a fever. You should take your dog to your veterinarian if the temperature rises above 104 degrees and lasts more than a day or so. Kidney disease: Your dog may not show any symptoms after rental failure or chronic kidney disease at beginning, but the symptoms will appear out of nowhere. Your dog will start to urinate more frequently and show other signs, such as shaking. Therapy and treatments like furosemide help manage renal disease better. Addison's disease: Dogs that develop Addison's disease don't have enough cortisol in their bodies. If you notice your dog to have low energy and strength with loss of appetite and some gastrointestinal problems, this could be due to Addison's disease. Trembling is also one of many symptoms associated with this disease. Dogs can shake for many reasons not mentioned above. For instance, some dogs tremble because of low blood sugar, while others may shake due to low blood calcium, electrolyte imbalances or allergic reactions. Brain tumor, genetic disease, hind-leg tremor and certain diseases affecting the spinal cord can all lead to trembling and shaking in dogs. It is common for dogs to shake some time, but if you cannot pinpoint a reason why your dog has started shaking heavily, you should see your vet. It becomes even more important when you notice other symptoms such as diarrhea, vomiting, weakness, depression, loss of appetite, eye problems, lethargy, gagging, coughing, and other concerning signs.